General Dynamics’ four-channel Digital Modular Radios (DMR) are being upgraded with high-frequency dynamic routing (HFDR) software to turn the radio’s four channels into eight virtual channels. Also, the new high-frequency virtual channel exploitation software expands the DMR’s communications capacity to 16 virtual channels when operating in the high frequency (HF) line-of-sight and ultra-high frequency (UHF) satellite communications frequencies. 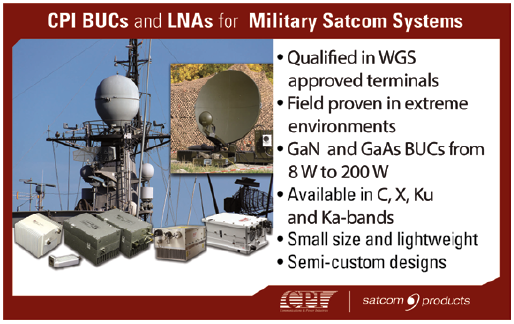 General Dynamics engineers are also working to integrate the new Mobile User Objective Systems (MUOS) waveform into the DMR radios. 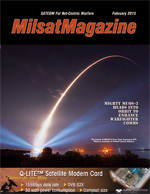 The waveform is the digital dial tone needed to connect to the U.S. military’s new narrowband MUOS satellite communications system. 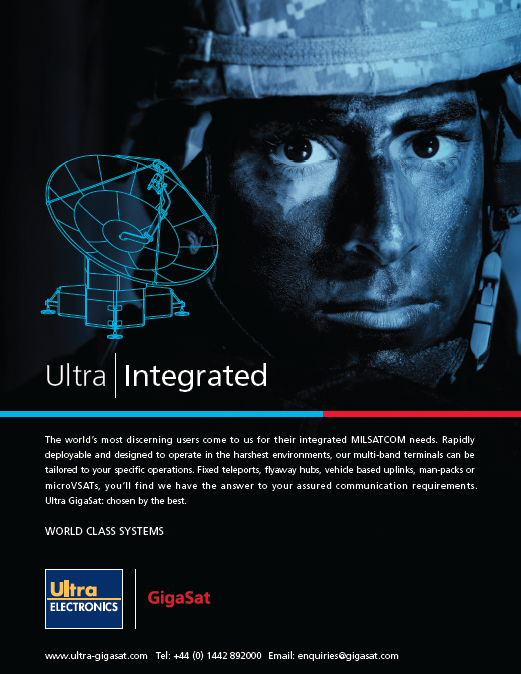 Once the MUOS network is operational, Navy personnel will experience the global reach, voice clarity and connection speeds similar to their cellphones they use at home. Built using open architecture standards, the DMR radios will continue to provide improved functionality and interoperability while accommodating next-generation communications waveforms, like MUOS, the Integrated Waveform and future advanced network communications waveforms. General Dynamics (NYSE: GD) combined the resources of Advanced Information Systems and C4 Systems into “General Dynamics Mission Systems” in September of 2014. 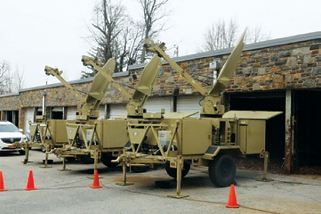 The Maryland Army National Guard’s Company C (Signal) of the 29th Infantry Division was the first unit in the Army to field and train on the latest tactical network at the Military Reservation in Pikesville, Maryland. The Maryland Army National Guard’s Company C (Signal) of the 29th Infantry Division was the first unit in the Army to field and train on the latest tactical network at the Military Reservation in Pikesville Maryland, January 14, 2015. Known as the Warfighter Information Network-Tactical Increment 1 (WIN-T Inc 1), Soldiers at the battalion level and above are provided with a high-capacity voice, data and video communications. This networking system has been a major support for more than 94 percent of the Army and National Guard’s tactical network and a full range of military operations since 2004. Hughes said the new upgrades on the WIN-T Inc 1 would allow faster responses when there are natural disasters and the Maryland National Guard is needed to support its citizens. “Look what happened to Hurricane Sandy on the coast of New Jersey, there are places right now that don’t have basic services. The Guard’s critical mission in the state is now enhanced greatly. It’s great to have the Guard getting [this] first,” Hughes said. The four modernizations to the WIN-T Inc 1 networks are: End Of Life Technical Refresh (EOL Tech Refresh), the WIN-T Inc 1b Upgrade, Network operations (NetOps) Convergence Upgrade, and the High Capacity Line Of Sight (HCLOS) Radio upgrade. The EOL upgrades include new commercial hardware and software components such as routers, switches, servers and firewalls. The new products reduce size, weight and power (SWaP) by combining capabilities that once required their own hardware on virtualized servers. The EOL also enables the Army to reduce the number of required Increment 1 transit cases by one third, shedding 1,000 cases over the next three years, and reduces the weight of the remaining cases. The WIN-T Inc 1b upgrade adds the Network Centric Waveform (NCW) modem that takes advantage of NCW, a dynamic waveform that optimizes bandwidth and satellite utilization. Another key attribute of the NCW is that it enables Soldiers to send all information across the battlefield securely. “The 1b allows us to do a number of different things,” said Lt. Col Joel Babbitt, product manager for WIN-T Increment 1. “It makes the Increment 1 a Swiss Army knife of communications. We could put Top Secret traffic through it; we could commercial traffic through it like we’re doing right now for Operations United Systems in West Africa for Ebola response. The NetOps Convergence Upgrade simplifies and reduces the number of network management tools that communications officers use to manage the tactical communications network. The HCLOS radio upgrade provides more than a fourfold increase in throughput, enabling higher-data applications such as full-motion video, high definition video teleconferencing, and network convergence. Twelve National Guardsmen within this Maryland-based signal company have the privilege to learn, use and to train their fellow Soldiers on the new the WIN-T upgrades. “Some of the other Soldiers couldn’t make the training today, so moving forward we’re going to have to get them up to speed, just in case one of us is out,” said Sgt. Dewayne Carruth, a nodal network systems operator-maintainer, with the 29th Inf. Div. An aggressive fielding schedule is planned to rapidly bring this new equipment capability to all Army WIN-T 1 units by the end of 2017. Northrop Grumman Corporation is among the companies that have been awarded a contract by the government of the United Kingdom to provide a range of cyber security solutions. Outpacing the rapidly evolving cyber threat spectrum demands constant innovation. Northrop Grumman has been battling cyber threats for more than 30 years and, through aggressive technology investments in key research areas such as identity management, situational awareness, modeling and simulation, cloud security, and supply chain, has a deep understanding of the breadth and complexity of cyber. It is embedded in everything we do. Under this competitively awarded, seven-year framework contract, Northrop Grumman will provide engineering and development services in support of data security and information assurance. Northrop Grumman continues to invest in U.K.-based cyber security capabilities with new facilities in England, where the company has established an Advanced Cyber Technology Centre of Excellence, a global collaboration initiative to advance high-end solutions for the most challenging cyber problems. Army scientists and engineers are advancing sensors research in hopes of giving future soldiers enhanced situational awareness. Sensor technology has broad application across the Army. Medical researchers are investigating how physiological sensors may help soldiers achieve superior performance on battlefields of the future. Soldiers of 2025 and beyond may wear sensors to help detect and prevent threats such as dehydration, elevated blood pressure and cognitive delays from lack of sleep. Army researchers are working on flexible plastic sensors that could be attached to individuals, gear or vehicles. With this technology, soldiers will gather information on the chemical-biological environment, troop movements and signal intelligence. “I think that Army [Science & Technology] is looking at a broad number of approaches for what sensor capabilities we will need to meet future challenges,” said Deputy Assistant Secretary of the Army for Research and Technology Mary J. Miller in an interview with Army Technology Magazine. “Our real goal will be to build in multi-functionality,” said Karen O’Connor, Command, Control, Communications, and Intelligence portfolio director for the Deputy Assistant Secretary of the Army for Research and Technology in the Office of the Assistant Secretary of the Army for Acquisition, Logistics and Technology. One critical area of research is enhancing air operations in degraded visual environments, known as DVE. At the Aviation and Missile Research, Development and Engineering Center at Redstone Arsenal, Alabama, Army engineers are advancing and implementing new technologies. One research program fuses images of multiple sensor technologies such as radar, infrared, and laser detection and ranging, also known as ladar. Each of these sensor technologies provide unique advantages for operating in various types of DVE conditions. “Successfully fusing the images of radar, IR, and ladar provides the pilot a more accurate, high-resolution picture of the operational environment in all DVE conditions by exploiting the advantages of each sensor technology and compensating for its weaknesses,” said Maj. Joe Davis, an experimental test pilot at Aviation and Missile Research, Development and Engineering Center, or AMRDEC, Aviation Applied Technology Directorate. “Army researchers are working on flexible plastic sensors that could be attached to individuals, gear or vehicles. With this technology, soldiers will gather information on the chemical-biological environment, troop movements and signal intelligence,” said Jyuji Hewitt, executive deputy to the commanding general of the U.S. Army Research, Development and Engineering Command. Sensors are redefining our world and how research and development community supports soldiers. As networking and communication technologies become decentralized and integrated into dynamically aware sensors, sensors have emerged as a focal point where soldiers are connected into the digital battle space at both the individual and global level, Reago said. The Army is really relying on its scientists and engineers, Miller said. Northrop Grumman Corporation will begin production of four RQ-4 Global Hawk unmanned aircraft systems (UAS) for the Republic of Korea’s Air Force. The systems will provide valuable wide-area intelligence-gathering capabilities to military commanders to enable them to make more informed decisions. Under a contract awarded December 16, 2014, the company will work closely with the U.S. Air Force to deliver the systems starting in 2018. “It’s clear that U.S. allies have seen the critical role Global Hawk plays for the U.S. Air Force around the world,” said Mary Petryszyn, vice president, International, Northrop Grumman Aerospace Systems. The contract is for four aircraft, two ground stations and supporting equipment that allows Republic of Korea Air Force operators to control and maintain the syste m.
“This is a significant achievement for Northrop Grumman as it represents the first time a Global Hawk has been sold to an allied nation in the Asia-Pacific region under the Foreign Military Sales process,” said Mary Petryszyn. The contract announcement follows significant procurement decisions made by the Japanese and Australian governments to purchase the Global Hawk and the MQ-4C Triton—comprising Northrop Grumman’s family of high-altitude, long-endurance UAS. The Air Force Global Hawk evolved from DARPA technology and was deployed overseas shortly after the September 11, 2001 terrorist attacks. Today, the active Global Hawk enterprise is made up of three complimentary systems—the Battlefield Airborne Communications Node (BACN), Global Hawk Multi-INT for situation awareness and intelligence and for situational awareness and targeting. 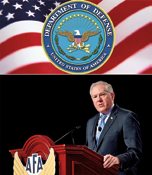 The severe, multiyear budget cuts of sequestration will have a negative impact on the Defense Department and U.S. military technological superiority, Under Secretary of Defense for Acquisition, Technology and Logistics Frank Kendall told a congressional panel. Kendall testified before the House Armed Services Committee with Air Force Lt. Gen. Mark Ramsay, director of force structure, resources and assessment for the Joint Staff. The topic was the Department of Defense and technological change. Kendall was asked to advise the Senate Homeland Security and Government Affairs Committee on areas in which Congress could help DoD improve acquisition outcomes, he said. Number one, by a wide margin, he said, was that Congress should end the threat of sequestration. “This is a huge problem for the department,” Kendall told the panel, “and not just because of the uncertainty associated with the department’s ability to plan or the inadequate resources that sequestration levels will provide. I am very concerned about the increasing risk of loss of U.S. military technological superiority. We’re at risk and the situation is getting worse. U.S. military systems depend on a few high-value assets, he added. “We start with space-based assets—satellites, which in relatively small numbers provide an important function for intelligence, targeting and communications.” Other elements are aircraft carriers and airfields. Kendall also discussed a program called the Aerospace Innovation Initiative, part of the broader Defense Innovation Initiative that Defense Secretary Chuck Hagel announced last fall. The larger program seeks to streamline DoD business processes, operational concepts, training and other activities. The Defense Advanced Research Projects Agency (DARPA) initially will lead the program, which will involve the Navy and the Air Force and develop prototypes for next-generation air-dominance platforms or X-Plane experimental programs, Kendall said. “To be competitive, the Navy and the Air Force each will have variants focused on their mission requirements. There will be a technology period leading up to development of the prototypes,” he added, and a reduction of the lead time it takes to produce next-generation capability. Kendall said one effort designed to address economic challenges is an acquisition tool called Better Buying Power 3.0, which continues core aspects of earlier versions, shifting the department’s focus toward technical excellence and innovation.